7.1 Megapixels for stunning prints as large as 16 x 20. 3x Optical Zoom-Nikkor Glass Lens - Nikkor optics provides exceptional pictures. Optical Vibration Reduction/Image Stabilization minimizes the effects of camera shake. 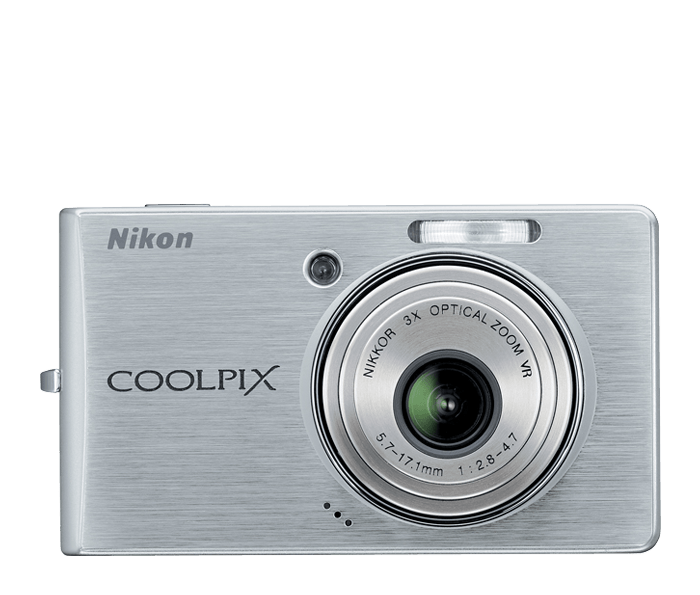 Incredible, bright 2.5-inch high resolution LCD makes it easy to share and compose your pictures. All new stylish, stainless-steel design slips right into your shirt pocket or purse! Auto adjusts up to ISO 2000 so you can keep shooting, even in lower light. Nikon In-Camera Innovations featuring: In-Camera Red-Eye Fix(TM) that automatically fixes most instances of red-eye in the camera, Face-Prioriy AF automatically finds and focuses on faces, and D-Lighting rescues dark or backlit images by improving brightness and detail where needed. Electronically controlled timer with duration of 3 or 10 sec.